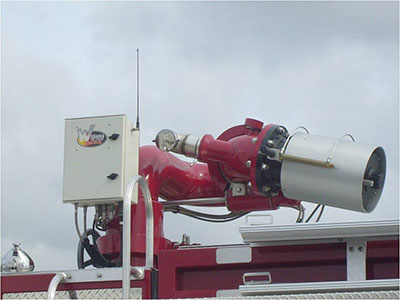 The “Ambassador” Series Large Volume Deck Gun is a monitor/nozzle package designed to address today’s Industrial firefighting and protection needs. 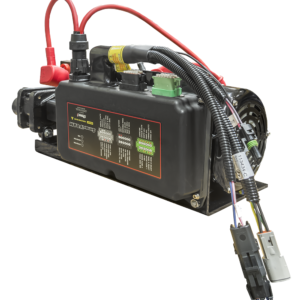 This high volume delivery system is available in either wireless or hardwired hydraulic driven remote control in 12 or 24 VDC with manual hand wheel & nozzle pattern adjustment overrides. The “Ambassador” monitor/nozzle combination is capable of large volume discharge to elevations never before attained by conventional equipment to provide fire suppression, cooling, personnel protection, toxic gas dispersion and more. 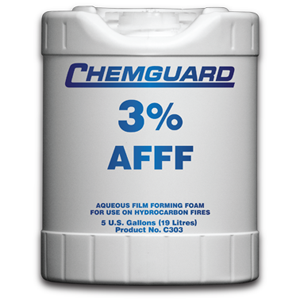 Discharge flow rates from 2,000 – 6,000 gpm (7,571 – 22,700 Lpm) can be water only, Hydro-Foam™ or Hydro-Chem™ for extinguishing liquids and gases under pressure. This “Hybrid” nozzle has the unique capability to perform as an automatic pressure and fixed flow nozzle. 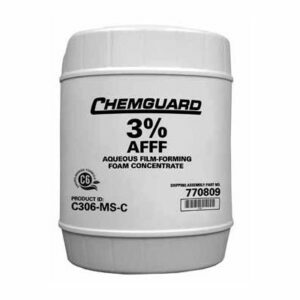 During automatic operation, the nozzle will respond to varying flows to maintain a nearly constant tip pressure at 100 psi (6.9 bars) ± 10%, thus maximizing effective range for a given discharge flow. Once the nozzle reaches the fixed flow set point between 2,000 – 6,000 gpm (7,571 – 22,700 Lpm), it performs as a conventional fixed flow nozzle. This feature is desirable for foam proportioning operations on storage tank fires or other hazards requiring specific application rates. This nozzle is capable of Hydro-Foam™ proportioning at rates up to 6,000 gpm (22,700 Lpm) @1% or 3% (3,000 gpm or 11,356 Lpm @ 6%) using remote jet pump technology. The extensive “Ambassador” options list allows this nozzle to be Hydro-Chem™ capable with PKW flow rates from 25 lbs/sec (11.3 Kg/sec) to 100 lbs/sec (45.4 Kg/sec). The single 8” full flow stainless steel waterway construction provides minimum friction loss, maximum efficiency, and years of trouble-free service.